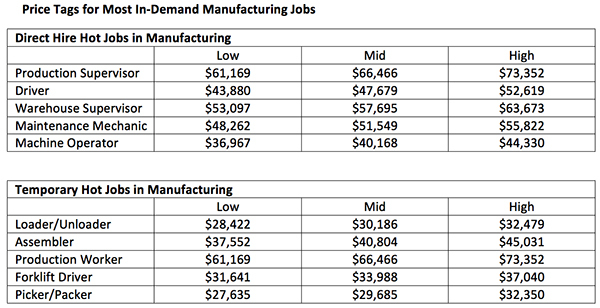 How to compete to fill the 10 most in-demand manufacturing jobs. Yet, in the case of economy and business, often the good comes with some bad. In this case, there is a shortage of skilled talent to maintain production output while capitalizing on growth opportunities. With encouraging prospects of advancing their businesses, industry leaders must continue to focus on human capital investments — in other words, recruiting and retaining the talent needed — to turn that vision into reality. Though, for many, understanding exactly how to most effectively attract and engage skilled talent is complex and murky. Although some leaders may dismiss the idea that a minimal pay increase can improve retention, the majority of manufacturing and logistics hiring managers in the same report identified salary increases as the most effective strategy for decreasing turnover rates. In fact, 70 percent would be willing to pay slightly more per hour for key manufacturing/production floor positions if it meant fewer or shorter vacant positions.4 The bottom line is that while money may not be the best or only motivator, its absence is highly demotivating. Knowledge Is Power — Do You Know How Your Company Stacks Up? With executives around the world identifying talent-driven innovation as the number one factor of competitiveness, it is evident that talent shortages can have a material impact on manufacturers’ growth and profitability. This is particularly true when it comes to productivity levels: consider that the average full-time employee who is contemplating a job change typically reduces their productivity and innovation up to six months prior to their departure. Potential candidates and current workers (contractors and full-time employees) need to feel that their pay is equal in value to that received by their peers within the organization (internal equity) and in other organizations in their industry (external equity). If workers feel that their pay doesn’t align, it’s usually only a matter of time before they explore other employment opportunities or, worse, become disengaged. Randstad has an extensive understanding of hiring trends in the industrial sector, including the most in-demand temporary and direct hire jobs and the competitive cost to hire and retain workers to fill those positions. Based on research from Randstad’s 2017 Hot Jobs Report and 2017 Salary Guide, employers can assess the strength of their pay rates for today’s hot jobs against those of competitors, who frequently vie for the same talent. For hiring managers and employers, it’s not enough to just be in line with the market or match the competitor’s offer. The wage must be appealing enough to give passive candidates a reason to consider a new opportunity and not drive active job seekers to take their talent to the competitor. If your pay is below average, consider whether the cost of losing talent to competitors justifies salary adjustments for new hires or current employees. You can pay for great workers now, or you can pay for them later.